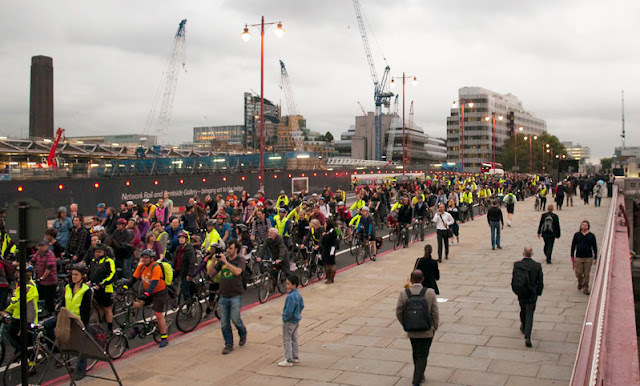 The Blackfriars Bridge protest ride on Wednesday has already been excellently covered by ibikelondon, Cyclists in the City, and the London Cycling Campaign blog, so I need not repeat too much of what has been written and pictured there. Zefrog produced an excellent set of photos of the event despite the technically-challenging low light conditions. Suffice it to say that the organisation by LCC was exemplary, as was the facilitation of the event by the Metropolitan Police. Between 2,000 and 2,500 people took part, making it the largest cycle demonstration ever held in the UK. I have no doubt that, were LCC to call a repeat, even more people would take part next time. The word is spreading more and more; more and more cyclists, pedestrians and public transport users are understanding how regressive are Transport for London's policies for its roads, at Blackfriars as well as all over London, prioritising motor vehicle throughput at virtually all costs, and those people are willing to stand up for an alternative vision of "safe streets for people": a demand merely that our main streets be designed in a way that would be regarded as standard and uncontroversial in virtually any other Western European capital. On a gloomy London autumn evening, colourful flashriders fill the bridge. Photo by Joe Dunckley. Politically, the most important aspect of Wednesday's demonstration was the presence of senior representatives from all four main political parties. These included two mayoral candidates: Brian Paddick for the Liberal Democrats and Jenny Jones for the Greens. Ms Jones' commitment to cycling is well-known. Ex-police chief Paddick did not have a particularly striking policy emphasis on sustainable transport last time he stood for Mayor, but, as the Bible says, "There is more rejoicing in heaven over one sinner that repenteth..." Also present were Assembly Members Caroline Pidgeon (Lib Dem), Val Shawcross (Labour, vice-chair of the Assembly Transport Committee), and Andrew Boff (Conservative). The LibDem evisceration of the best part of the localism bill shows that we're in coalition with a bunch of statist shits. Role on 2015. However, this is off the point. My point here is that this is a kind of protest movement that is new. Here is a phenomenon with which it may take politicians and civil servants some time to catch up: what I might call a technical protest. That is not to say that it is about anything trivial or minor. Far from it, these are lift-and-death issues, and that is why they stir passion. But what I mean is that environmental protest in the past has been very much "Stop that", Down with the other", "Not in my back yard", etc. : rather black and white, crudely and simplistically for or against something, with demands that are easily captured in a sound-bite. But here were 2,500 people protesting on the very technical subject of road design. They don't like the design that Transport for London want to implement, and they want something else, and they know what they want. They are not arguing simply for lower speeds, not simply for segregated cycle lanes, but for a whole design package: one that includes these things, but also better streetscape, more pedestrian space, fewer lanes of motor vehicles, better design of junctions and cleverer signal systems to get cyclists, pedestrians and motorists safely through them. This is complicated stuff. This is not like the roads protests of the past, which were either attempts to block the construction of bypasses, or generalised demos against everything to do with car-culture (as in the "Reclaim the Streets" movement). This is new phenomenon which can only have come about in the internet age. It depends on a spreading of knowledge of detailed, technical aspects of the design of public space in a way that is comprehended by a large number of non-specialist people, though pictures, descriptions, animations. This may make the professionals in the fields affected very uncomfortable: they may resist being taken to task by amateurs who they feel lack the understanding of the subject that they have trained long and hard to gain. Or, alternatively, they could embrace the far higher level of public dialogue that this promises on the aspects of urban design which are so crucial to our environmental wellbeing. It is because we now have websites like that of the LCC, like View from the Cycle Path, like the Cycling Embassy of Great Britain, and others, that people can be mobilised to support particular detailed visions, future projections of what British public space could look like, when they see that what is being suggested would be so much better than what they are being offered by politicians and professional planners. I think this is really the case: I don't think those at Blackfriars, on Wednesday, in general, were just "anti-car". They were protesting positively for something very particular: a new settlement of space and priority in the city vis-a-vis walking, cycling and driving. Part of my evidence for this is the considerable number of people who have seen LCC's Blackfriars design and said they are joining the campaign because of it. They were not conviced before that the campaign was doing anything particularly effective, but this has convinced them. As you’re aware we’re currently rebuilding Blackfriars railway station to provide for growing passenger numbers, longer trains and more frequent services. The coming years will see substantial growth in the number of people using Blackfriars station, and changes need to be made to the road network around the station so that it can cope with an increased volume of pedestrian traffic. The road junction north of Blackfriars bridge is owned and maintained by TfL. As such they have taken the lead in designing and delivering a new road layout to accommodate all road users over the coming decades. We’ve worked closely with TfL to ensure their road layout is compatible with our station designs and we fully support their plans. And that, insultingly, is it. Simon Kirby and Network Rail obviously have not looked at the LCC plans, or in any way considered such alternatives. He makes no attempt to justify the current TfL and Network Rail plans for the streets on any grounds whatsoever. He makes no attempt to explain how these plans are better for rail passengers than LCC's alternatives. He would have a tall order trying to do so, because they are obviously far worse. So Network Rail is here opposing the interests of rail passengers and refusing to enter into any discussion of the street design around their station. This is simply a professional closing of ranks, insulting the intelligence of the public, and hoping that these annoying people will shut up and go away. Successful politicians of the future will have to wise-up to the new reality of technical protest in regard to the streets and other aspects of the environment. They will have to realise that large numbers of people can now understand the need for sophisticated solutions to complex problems. It's now no longer a case of the technocrat, or politician, telling the people who are baying for some crude solution that "It's not that simple". It's the other way round: the well-informed populace explaining the details to the politicians: a clear new phenomenon of the Information Age. The successful politician of the future will not necessarily understand all the details themselves; Boris is clearly no grasper of technical detail. But they will be able to sense when their "experts" need to be told that they must listen to others who know a thing or two about their subject as well. Throughout the summer, we've been keen to emphasise that the campaign over Blackfriars is part of a bigger, more widespread push for a people-friendly London. And in the New Year, the London Cycling Campaign will be officially launching our Go Dutch campaign, voted for by our members, which will be pressing all the mayoral candidates to take London along the pathway towards safe and convenient cycling, and a truly people-friendly urban environment. This means addressing every bad junction and every busy road, so they're safe and convenient for Londoners of all ages and experiences who want to cycle. In the coming days and weeks, we’ll be fleshing out the principles for what this means for London’s main roads, and in the New Year we’ll be publishing more exciting graphics and designs, showing what fantastic public spaces so many major locations in London could be. So TfL will know that whenever it plans to revamp a road or a junction in its old style (and the next example is likely to be the King's Cross junction, where cyclist Min Joo Lee was killed on 3 October): they can expect lots more of the same trouble. They can expect their designs to be challenged in a high-profile way. They can expect bigger and bigger protests, more people questioning the competence of their designers, more politicians coming over to our side. It may not happen with Blackfriars, and it may not happen with Kings Cross, but at some point they will be forced into the 21st century. Cyclists and pedestrians of London, now that you have a clear strategy, you will win, as the cyclists and pedestrians in the Netherlands did in the 1970s. Keep it up. On the other hand, the franchise of the Mayor is London-wide and Boris was elected by the voters of outer London. It is the commuters going from stations like Mill Hill Broadway and Hendon to Blackfriars who are his core constituency, and it is them who he is short-changing most of all at Blackfriars, but most of them probably don't realise it at the moment. So I think it is crucial that the campaign mobilises the train commuters. How to do that, I am not sure. Letters to the outer London local papers would be a start. Actually, three of the five pols at the ride (Andrew Boff, Caroline Pidgeon and Jenny Jones) are "London Wide" assembly members - they don't merely represent a central or outer constituency. Having met Andrew Boff, I was impressed by his committment to cycling at a personal level but the fact remains that he is (or so I perceive) a Libertarian Tory. In unvarnished form, that simply means believing that individuals should have the freedom to do as they choose. The flaw in that policy of course, at least in terms of the way it is implemented, if not in terms of the way it is expressed, is that the rich, or the strong, or the influential in practice have more freedom of choice than the rest of us, and their choices impact on others - 1.5 tonnes of fast moving metal trumps 15kg of bike. On the other hand, Boff's opposition to TfL on this issue, and his presence at Blackfriars, is not necessarily inconsistent with his support for his party or the Mayor. It does strike me that the recurring theme of "Yes Minister" on the telly way back when, that the most powerful politicians are actually given the runaround by their civil servants who use their guile or their command of technical issues to get their own way, is ever present in real political life today. Is it possible that Boris just lets TfL get away with it because he doesn't really understand their technical arguments well enough to pick holes in them, and is too proud (or arrogant) to admit it? Was Ken really much different in that respect? Certainly, despite an Oxford MA and a career in the City, it baffles the hell out of me.